Product #2344 | SKU BEVP1800S | 5.0 (based on 1 rating) Thanks for your rating! Designed for musicians by musicians, the VP1800S subwoofer merges incredible sonic performance with amazing affordability. The VP1800S is supremely portable and well suited for musical applications, and is the natural choice for commercial installation. 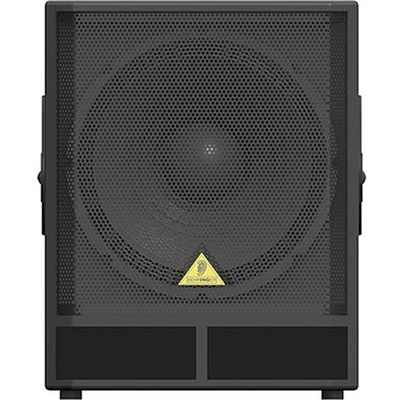 The VP1800S subwoofer is engineered to handle the demands of professional gigs, from small clubs to large stages. With its 1,600-Watts power handling capability, the VP1800S cranks out massive amounts of aggressive bottom-end, making it the ideal way to add tremendous punch to your current sound system. In order to produce tight, deep bass, a subwoofer has to move lots of air. EUROLIVE loudspeakers accomplish this by using powerful, long-excursion LF (Low Frequency) drivers that are handmade in our own factory. While some companies are content to use “off-the-shelf” drivers, we custom-design each LF driver to perfectly match its enclosure and application. The VP1800S features a powerful 18" long-excursion LF driver in a tuned enclosure, providing rich, tight bass all the way down to 40 Hz. That’s extraordinarily deep bass that will shake the house right down to its foundation. The VP1800S is capable of extremely high sound pressure levels (100 dB half space 1 W @ 1 m) and provides a 40 to 200 Hz frequency range. A standard 35-mm (1.375") pole socket is provided for pole-mounting loudspeakers atop the VP1800S. The internal Low-pass filter (LPF) is fixed at 150 Hz. Both 1/4" and professional-style twist-lock connectors are provided. I brought one of VP 1800S Subwoofer from Kosmic and its make happy all the time when I play my Island music its sound terrific that's why I need one more of this, please can I buy this one now.